Wow, wow and wow!!! This is an absolute “must have” for the time travel enthusiast! Even if I’m wrong, it’s easy reading and only some 130 pages so you may as well give it a go! Dan inherits a time belt from his Uncle Jim. By setting the controls on the time belt Dan is able to move from one point in time to another. On his temporal travels Dan meets and interacts with himself causing countless time loops and potential for quirky paradoxes. Whilst there is no specific plot, the reader is carried along with the main character in his search for perfection in himself and in his environment. The mechanics of the how the time belt works is not revealed. This is not an omission, but I think deliberately left out so that we can empathise more with Dan and his own confusion into essentially a black box time machine. How it works, or what the consequences are of its use (or misuse) is not known, and to a large extent is learnt ‘on-the-job’. The idea of a parallel universe where time lines diverge is played through and often this leads to an alternate version of Dan coming back (or forward) to (re/post)visit himself to warn of possible dangers. This seems to be the only instruction manual. Time loops and strange realisations of cause and effect are bountiful…but interestingly there are no paradoxes. This is because whilst there are several versions of Dan the book is written from the viewpoint of only one of them. What happens to the others is not completely known to the writing version him and so the paradoxes are not explicitly mentioned. However, Dan does think about them and we are privy to his thoughts…which are very interesting, though by his own admission may not be correct! This is yet another first person time travel novel but in this case I don’t think that the book could have been written in any other way. In fact the first person narrative allows for a very clever alternative to description by relating introspective thoughts to the reader which serve as thought experiments playing through scenarios and consequences of time travel. Naturally this brings about a feeling of loneliness – Dan primarily interacts only with himself and doesn’t seek or ask for help from friends – there are very few other characters in the novel. In a way this is a little like Audrey Niffeneger’s “The Time Traveller’s Wife” where the time traveller also suffered loneliness in that he was the only one ‘afflicted’ with time travel and was disappointed that there wasn’t an army of fellow time travelers. The Man who Folded Himself is available from Amazon.co.uk and Amazon.com (affiliate links) and comes with the highest of my recommendations – an easy 5/5 stars! Some time ago I took a short break to Texel – one of the Wadden Sea Islands off the coast of Holland. Quite by chance (or so I thought…) I ended up in a cafe called “De Tijd” (“The Time”). The walls were absolutely plastered with clocks! The waitress told me that they were all gifts, donated by patrons over the years. Now (sadly) there is not enough wall space for the tradition to continue, but instead notebooks lie on each table for visitors to jot down any thoughts they might have (regarding the food they’re eating, where they’ve come from, etc.). wall of clocks…with yours truly! elapses from the time, time!!! And talking of things above my head (and I’m talking quite literally here!) did I mention that the ceiling space was also used as efficiently as the wall space? Whilst we were waiting for the food to be prepared, my wife reminded me that we’d been here the previous year. I’d forgotten all about it! We were having about to have a ‘Deja Eat’! So my wife as reliving her past I was living the present, and as the food was brought in, served on a time-plate, I couldn’t help thinking of Plato (sorry…! 😉 ) and his wish to remember the future. Maybe we’ll be back next year…but I can’t remember! I have a doppelganger. He looks a bit like me and he behaves a bit like me. But he’s not me; he’s a little taller but not as scrawny, he’s a bit less bald, and he doesn’t wear glasses. He wears a black coat as I do and slings a small grey rucksack on his back. As I do. And he really gets on my nerves. Like me, he doesn’t talk to other passengers on the train and avoids them by fixing his focus on glitzy but intellectually dull pages on a free newspaper. Reading about characterless celebrities with non interesting lives. Loser. At least I read books. Or write in my journal. But sometimes he likes to watch real people. The first time I caught sight of him I thought he was a pillock and best avoided. The trouble is that it seems he’s everywhere I am – and can’t be avoided! He catches my train every morning. And he cycles to his office on the other side of the road as mine, pedaling the same speed as me – either just in front or just behind. He leaves his office when I do, and cycles again either just in front or just behind me, back to the train station where he catches my train to take him back to his home. He waits on the same part of the platform every day so that he’s best positioned for his favourite seat – a single seat towards the back of the carriage where he can sit without the elbows and knees of an adjacent passenger protruding into his personal space. I like to sit on the seat at the side with the back to the window. Many don’t like it as it means a sideways motion when travelling and that means I have space. No arms or legs or bags or large newspapers invading my personal space. And I can watch him trying not to let me see him watching me! He observes everything with silent disdain; a scowl or disapproval of any facet of life he may encounter in his unchanging sphere. And yes, I have caught him eyeballing me too, through the corner of his eye – I have seen it! I’ve never spoken to him, but he’s never spoken to me either. He started it. A couple of times I have tried to make contact; to break the strange awkward aversion, but it never pans out. When I make a deliberate sustained look directly towards him, that’s when he sneezes, or reaches for his phone, or looks the other way. There’s always some excuse to not look at me directly. What am I…Medusa? It seems that there is an unspoken battle between us, although I cannot say over what. Maybe for our very own existence. I wonder. I read something a while ago that doppelgangers can’t share the same space or time – it is a paradox of causality. Some explain that multiple versions of a person exist in multiple parallel universes which are created at “bisection points” – when alternate outcomes of momentous or key decisions have been made. Personally I don’t believe in the instantaneous creation of mass and energy out of nothing on a whimsical decision. But if it were true, maybe a crossing or an intersection of these [not-so-parallel] universes would allow a person to meet an alternative version of himself? Or would interaction cause one or both of us to disintegrate? Or the universe? I don’t know. But I do think it would be painful to find out. I’ve only ever seen him smile once. Perhaps. Actually, it was more of a smirk. I hadn’t seen him for a few days since the weekend. I wondered where he was because he wasn’t waiting on the platform at his usual place. He must have been ill because on Thursday he was back and letting me know about it as he was coughing loudly on the train. And he wouldn’t stop. It was strange because he wasn’t on his favourite seat – he was sitting behind me. I bet he did it on purpose as my side bench wasn’t free and I was sitting on a regular forward facing double seat. I could almost feel his germs flying through the stuffy train atmosphere in a direct but statistically random walk to the back of my own bald head. I stood up early to leave the train so I was facing him whilst he remained seated. He decided to sneeze at that moment to avoid eye contact, but I’m sure I saw a smile of smugness, content that he’d infected me; an invasion of my physical and personal space. As I stepped off the train there was a cough behind me. Too close behind me. It was him. He followed me, as he always does, on his bicycle on the way to work. Some may call it slip streaming, but I find his close proximity disturbing. Shadow cycling. He was right there by the mudguard of my back wheel…so close I could hear him sniffing. I increased my speed, and he matched it. I slowed, as did he. Why won’t he just overtake me? In desperation and frustration I weave from side to side in a futile attempt to shake him off. Get in front! S**t before shovel! But I couldn’t get rid of him. I never can. He’s always everywhere I am. All the time. Day after day. It’s another day and I’m on the train again. I’ve forgotten my book and I have nothing to read. I’m bored. I need to do something to pass the time on this hour long train journey. Lying nearby is one of those ridiculous free newspapers. I thumb through a copy, bored as hell, but there’s nothing else to do. I glance at a few other passengers but they’re immersed with their phones. One is making notes and looking a bit peeved about something. I’ve seen him around quite a bit. He’s always looking at me. Must be a nutter, so I try to avoid him. I’m not feeling too well, I think I picked something up from some cretin in the train. And I think I know who. The last few days I’ve stayed at home; he’s probably aware of that and noted it down in his journal. But today I’m feeling a bit better and I’m back, but this stuffy air in this carriage isn’t doing me much good. It’s busy today, God knows why, so I’m sitting in a regular seat and already I’m blocked in and I can’t get up to walk to the train entrance where the air is fresher. It’s a really tickly cough that won’t go away. If I talk, it gets worse. I can’t get out. He’s come and sat in front of me now. He’s always around. I can’t get rid of him. Argh. I’ve got nothing to do! I’m so bored. I can’t even look through the window as my seat is by the broad metal window frame. I can look forwards at the back of the chair in front. That’s it. I’ll check my phone; it has pictures of my wife and girls. They cheer me up. I’m looking down at my phone. I’m trying hard not to cough but I need to sneeze. I can’t sneeze looking down, but as I inhale and look up he’s standing in front of me. He’s always there! Wherever I am! No matter. It’s my stop, and I can lose him. Besides, my wife loves me. So do my girls. I smile at the thought and stand up. When I get my bike from the bike shelter he’s there, looking at me. I always think he’s going to say something to me, but he never does. It’s very awkward. Thankfully he’s in front of me. I hate it when he’s behind me; I can feel his eyes bore into the back of my head. But it’s difficult with him in front too. He wobbles, and does unpredictable things. I’ve tried overtaking him, but he speeds up! In desperation I free wheel, but he slows down! Anyway, I guess I’m still recovering – I feel weak and my nose is running. I want to overtake him; to pass him and get shot of him, but I can’t. He wobbles all over the place making it impossible for me to do so. He’s in front of me again when I cycle home from work. I’m tired and not in the mood for this nonsense. He’s tailing me again. I’m nearing the end of my journey. I’m approaching the level crossing near the bike shed where I’ll leave my bike and catch my train home to my girls. It’s not far to go, but now I’ve had enough. I’m running late, and maybe I’ll miss my train. Surely it’s close. I urge the rubber of my front tyre to touch his back wheel – he can’t avoid me now! I call out. I can feel the pressures of two parallel universes twisting and contorting, striving to make contact at a single moment in time, at an elastic point in space. He looks behind, glaring at me. He slows, but doesn’t make space. There is a wailing and amber light engulfs us. Of course I have no choice but to stay back. As usual. He won’t let me pass. I try again to move to one side. Now he’s slowing down, but he’s holding out his arm. The noise is deafening. Whining. Screaming. He’s looking back at me. Within the amber lighting I can see a blur of blue and yellow. My train! It’s hurtling past me, a massive tonnage of metal relentlessly responding to electrical charges initiated on an atomic level and upwardly scaled to the real and tangible motion of matter of the train. I squeeze hard on my brakes; friction from the rubber on the front wheel losing its purchase on the ground which slides out from underneath me. When I roll over and get on all fours I see my bike in pieces near the rail track. No. My bike is still in one piece. That’s his bike; a twisted frame with sheared rough edges of metal agape. I stand and walk towards it. Blue light is flashing, but it’s hardly doppler. He’s nowhere to be seen. He saved my life; my current existence is because of him. But I’ll never seen him again. It’s ironic that I never wanted to see him but now I want to, at least just to say thank you. But that can’t ever happen. There’s his chair – empty, as if he never existed. Just a ghost through a train window. But my own existence still goes on. All of my seemingly endless journeys and musings about time travel on my daily train commute – has it all pointed towards this moment of proof? The train was delayed! I’m confused though…was time lost, or made up? Author Paul WandasonPosted on May 12, 2014 November 4, 2016 Categories ThoughtsTags proof, time, time travel, trainLeave a comment on Time travel train: moment of proof! Stephen Baxter’s The Time Ships is the authorised sequel to H. G. Well’s The Time Machine. How does this ship fare? The Time Ships by Stephen Baxter is pretty poor as a sequel to the original The Time Machine by H. G. Wells. This is mostly because the the Time Traveller displayed very different characteristics in each book, and the underlying messages and meanings in the original were not followed through. Indeed, the only ties between the two books were contrived references at the start of the novel and the Time Traveller’s attempt to rescue Weena at the end. As a novel in its own right, this is brilliant! Yes, it is clearly Baxter-esque with his Baxterisms of astro-engineering and Watchers etc., but there is some great science, and of course, elements of time travel. Whilst multiple and alternate universes are core to this novel, it didn’t strike me as an easy get out of jail free card as used in several other time travel novels (e.g. The Map of Time by Felix J. Palma). Actually, the idea was followed through really nicely and was internally logical and consistent with a brilliant ‘application’ at the time-space singularity at the beginning of time. The main character is a complete and utter pillock which for made for me some pretty angry reading (I must admit that in the first person I was reading Baxter as the Time Traveller) but at the same time I think it helped to nurture a real fondness for Nebogipfel through whom Baxter expresses his fascinating insights. Although this novel deserves 0/5 stars as a sequel to The Time Machine, I’m giving The Time Ships a full 5 stars as a time travel novel in its own right. The Time Ships is available from Amazon.com and Amazon.co.uk (affiliate links). I’m going to try something new with this review – I’m going to write it as I read…pseudo live, if you like! Perhaps I should first confess that I’m approaching The Time Ships with a little bit of prejudice…not simply that I’ve already read The Time Machine (and The Chronic Argonauts – arguably the predecessor to The Time Machine), but also that I’ve read some of Baxter’s works before and find many of them immensely irritating. This is because (subjectively speaking) I find much of his writing has googled science crow-barred into patronising narrative, as well as more than a few prods to NASA, which is probably related to him not being selected as an astronaut. Anyway. Let’s see how this goes! OK. So I’ve read The Map of Time which depicts a fictitious story around H. G. Wells, and I was moved to (re)read The Time Machine as it’s written in first person, implying, in a way, that the main character is Wells himself, and now I know a little bit more about him. I’ve also read The Chronic Argonauts (a very short story written by Wells, and predating The Time Machine) which some argue forms the basis of the more well known novel. * The Time Ships commences with an “Editors note” to introduce the novel itself as part of a bigger picture. This reminds me of The Planet of the Apes by *Pierre Boullon which also starts (and finishes) in a similar manner. * Baxter is trying to stay close to Well’s first person style of writing and using archaic and flowery language. I’m finding it a little unnatural and it reads almost like a young child’s description of events. I went here. I did that. I then found this… and so on. Actually, it’s a bit like Fred Hoyle’s dreadful style of writing (e.g. In October the First is too Late; The Black Cloud). Nice ideas, but you get rushed through. * Baxter clearly has a copy of The Time Machine next to him. He’s pulling out small occurrences from the Time Traveller’s dinner with his friends, and forcing them them into the narrative to give an impression of continuity. I know it’s a sequel…I don’t need to be rudely prodded as a reminder and have it spelled out. * Ah, the mechanics of the time travel! There’s a nice idea about twisting the 4 dimensions such that the temporal dimension lies on a spatial axis, meaning that motion through time can be achieved in much the same way as motion through space. A physical twisting of time. The Time Taveller therefore feels dizzy when he time travels because he’s being twisted and subjected to centrifugal and Coriolis forces. Centrifugal force is simply an object obeying Newton’s first law of motion and that it will move in an straight line at constant speed unless an external force (such as a twist) is applied to it. Coriolis force is the apparent force that an object seems to follow when it’s linear motion is viewed from a rotating frame. So you have one and not the other – you can’t be flung out from rotation in a straight line (centrifugal force) whilst experiencing Coriolis force which acts to give you a lateral motion (measureable from the rotating frame that you’re being flung out from!). * Second thoughts, I might let Baxter off. Centrifugal and Coriolis forces are 2 different ways of describing the same thing, but from two different (reference) viewpoints. A bit like time and space! OK…I’m now thinking it was a clever idea! * The time machine itself is powered by a substance called Plattnerite – a substance delivered by a mysterious visitor. Much as I don’t like the idea of a fuel cell of some description to activate time travel, I’m toying with the idea that this mysterious visitor will be seen later on in the novel! * There seems to be an over-play of how bad Morlocks are. I think this is again another reference to the original book, but here it’s not fitting, and I should think that such prejudiced feelings from the Time Traveller are not in keeping with the original character. * And here we are…Baxter hasn’t let us down with his precious Gaijin. Page 34 (of 630) and the Time Traveller is faced with A Watcher. So the Gaijin are back. * I’m getting quite angry. The Time Traveller is behaving like a complete and utter prick towards a Morlock who is clearly looking after him. This is not in keeping with the original character, though I should confess I’m probably most upset because I prefer to identify with characters (especially in first person novels), whereas this one is more like a stroppy teenager than the thoughtful and respectful scientist of the original book. For example, whilst there may be a hint of shame, there’s no real apology or outward show of remorse when he’s told that he’s killed children. No wonder the Morlocks appointed him a day carer. That’s a nice touch! I’ll let him off again here though, except to say that it seems that he’s to take many ideas from The Time Ships and developed them further in subsequent novels – much the same, as some believe, H.G. Wells did with taking ideas from The Chronic Argonauts, and developing them further in The Time Machine. * The Morlock’s name is Nebogipfel. i.e. the same name as the mysterious scientist in The Chronic Argonauts who later goes on to be a time taveller. Is this a coincidence, or opening the possibility of a temporal loop? I don’t think it too far to expect that many readers of The Time Ships will have also read both The Time Machine and The Chronic Argonauts!. * The Time Traveller ‘escapes’ from the future (Nebogipfel follows him into the time machine) and ends up a few years before his original time frame. He meets himself (as a slightly younger version) and this is an interesting read. * The younger version of himself is “Moses” – his little used first name…as well as the first name of the time traveller in The Chronic Argonauts Dr Moses Nebogipfel. Another possibility of a temporal loop? * Things are very different in 1944, thanks to war with the Germans. It’s an old and boring story line of alternate history which I find very exceedingly unoriginal. * Introduction of the term time technology – research into time travel, time machine construction etc..
* Quantum mechanics is used to explain the idea of parallel universes and alternate histories. Even though I don’t like parallel universes and find them an easy escape from some of the complexities of time travel paradoxes, I must admit that the uncertainty and probability underlying quantum theory make it very novel and almost makes the chance of parallel universes possible! * OK, the trouble with the Germans started on p198, and it’s taken till p314 to finally get past it. Dull dull dull. The section is full of names which I didn’t recognise (my own failing) but it turns out that these are key people in history, such as pioneers of bouncing bombs and soforth. * p323. Oh b***dy hell. The Watcher is back. * The Time Traveller and Nebogipfel find themselves so far back in history (the Paleocene) that the climate is now tropical. The Time Traveller notes that in his own time he never ventured to tropical regions. I found this to be an interesting side nod to the connectivity between time and space! * The possibility of causing an event in the past which will cause ripples into the future is astronomical. The Time Traveller kills an ancestor of a monkey, and Nebogipfel points out that this could significantly change the future. He then shows remorse at his action…notably more so that killing child Morlocks. * During his stay in the deep past, the Time Traveller seems to become increasingly a pillock towards Nebogipfel, about whom I must say that I’ve developed quite a liking. * Baxter shows a nice insight: the forest that the Time Traveller and Nebogipfel find themselves in is “self engineered” to withstand heavy flooding, by channelling water through grooves in the bark of tree trunks. This was well-written in the narrative, and not heavily levered in as in so many other cases. * Soldiers from 1944 come back to deep history and find The Time Traveller and Nebogipfel. Again, names of characters are mentioned who are key in history. This is getting tiresome and, dare I say, unrealistic…that one character should meet so many other well-known characters. “Good morning, Mr ___ ” he said, calling my name. So irritating! In the original, the name simply didn’t come up, whereas now it’s deliberately withheld. Very contrived, and weak. In one case, a character insinuates that the Time Traveller’s surname is Livingstone. That section of prose sticks out like a sore thumb! * Other named characters are given a huge fanfare of phoney intriguing introduction, culminating in the name being given at the end of the chapter. It’s nothing more than a nod to alternate histories (of which I am no fan). Certain that the inclusion of so many names must be of some significance, I had to approach google (it’s my own failing that I have a poor knowledge of history), and indeed, most of the names were historically significant. It makes it unrealistic that so many well-known (not to me! :; ) should come together at one place, one time and be connected to the Time Traveller. It got really tiresome, and predictable. * There’s a forest fire, and just as I’m thinking this is similar to the original, the Time Traveller ties grass to his feet and is reminded himself of his ‘earlier’ excursion. It’s a nice natural link between the books! * It’s sad that the boring war story line extends into this portion of the novel, but I suppose that’s a bit of the point. I especially like the football match (similar to the Christmas Day match during WW1). Needless to say a well known footballer from the past was involved. * The Time Traveller and Nebogipfel set the time machine to take them to the year 1891. This present is different from the present that The Time Traveller knows as it is populated by descendants of man from the Paleocene several millions of years ago. Baxter gives an account of the new ‘human’ species which has evolved, often referring to ants and ant-like motion. This reminded me of a sci fi novel I’d read but can’t for the life of me remember who wrote it (possibly John Wyndham) where ants occupy large metal structures because otherwise they are limited by their small size. * As expected from Baxter there is plenty of astro-engineering, but by now I think I’ve got used to it and it’s par for the course. * The new species are named The Constructors. Nebogipfel understands them better than the Time Traveller who of course is embarrassingly narrow minded and thick. Nebogipfel adapts well and is able to learn of the plans in time travel the Constructors have in mind, with help from a billiards table which serves as a demonstration of the role of time travel and multiple universes. I thought this was a very clever insight. * The construction of the time machine will take half a million years, so the Time Traveller and Nebogipfel time travel forwards in time by that amount when the Constructors’ own time machine is ready. During this travel, the physical space which they occupy is maintained by the Constructors, again, a brilliant insight from Baxter, from whom by now, I’m starting to forgive…whilst his ideas are repetitive (e.g. the vastness of time and space, watchers, astronomical engineering, ideas from other sci fi authors), I must admit that he’s b***dy good! * The Constructor’s plan is to go back to the beginning of time, and they take the Time Traveller and Nebognipfel with them. The descriptions from Baxter of the astronomical occurrences are really impressive, as is the final outcome – that the Constructors reach the singularity in time and space, and are able to disperse themselves in all universes of the multiplicity. * The Time Traveller and Nebognipfel are taken into an optimal universe (for the Constructors). The Time Traveller is again visited by his Watcher which is when he realises that the Watchers have been monitoring him all along, and have been engineering the artificial universe in which they find themselves. Having waited for so long in the book for some information about the Watchers, I felt the description came over as very rushed and without much back up. It is also soaked in pre-material for the Manifold Trilogy. * The Time Traveller at this point is experiencing total eternal infinity and is at a deep peace with himself…although there doesn’t seem to be any sense of peace conveyed – just bland, vague, and despite the overbearing brightness…dull. That said, it is interesting that after a while the Time Traveller recaptures his inquisitivity, showing that despite a change in his physical form he is still human. * The Time Traveller and Nebognipfel are returned to human form and placed in an alternate history. I thought Nebognipfel would get reconstructed a little more human like (i.e. of the Time Traveller’s form) and go back to Wales to close the circle from The Chronic Argonauts. (Why did Baxter give him such a name?) Instead he’s simply left by the Time Traveller who with no surprise at all turns out to be the mysterious visitor who bears the initial vial of platternite at the beginning of the novel. * The Time Traveller admits earlier that he is not one for long goodbyes, and Nebognipfel is a no nonsense kind of a guy, but I really expected something more. The paragraph really seems like an unfinished note that needs a little more expansion. It’s a real shame that Nebognipfel leaves the novel. He gives some really interesting insights, or I should say, Baxter describes his insights through Nebognipfel) such as how the point of singularity at the beginning of the universe works, or the possibility of multiple multiplicities. Staggering stuff, actually! * The Time Ships now remembers its origins as a sequel, and the Time Traveller goes forward in time to rescue Weena from the Morlocks. It is another sad note that he does this alone; it would have been interesting to read how Nebognipfel would have reacted to seeing alternate versions of Morlocks; the seed, perhaps, of the Time Traveller’s deep seated aversion to him. (B***dy idiot). * The Watchers seem to have disappeared. A hugely disappointing close to a story line…no wonder Baxter keeps returning to it in his subsequent novels. * Anyway. The novel is now reading more like a sequel to The Time Machine the style of writing is more true (e.g. with lengthy descriptions). * Actually the fact that the Time Traveller wants to save Weena shows the keeping of the character in the original. I think the character depicted in the Time Ships would really have preferred to go back to the Paleocene era. The first thing which needs to be said about Palma’s Map of Time is that it is a beautifully written piece of literature! This is all the more impressive in that the novel was originally written in Spanish and subsequently translated into English (by Nick Caistor) so perhaps a courteous nod to Nick is in order too! In short, The Map of Time takes the author H. G. Wells and his novel The Time Machine and spins a romance involving time travel around it. Distraught to the point of suicide by the murder of his girlfriend, Andrew Harrington is introduced to Gilliam Murray who runs a time travel tourism business. Andrew is informed that only forwards time travel is possible, so going back in time to prevent the murder of his loved one is impossible. A slim possibility of any hope at all in this realm in given in the advice to visit the author H. G. Wells who has published two time travel novels (The Chronic Argonauts and The Time Machine). The thinking is that by writing such novels, Well’s has mastered time travel and indeed has a working time machine which may be able to help Andrew in revisiting and altering the past. The theme of romance in this first section is continued in the second which focuses on characters involved in Murray’s time travel tourism business; Claire Haggerty doesn’t fit in with modern day societal conventions falls in love with a man from the future, Captain Derek Shackleton. They meet physically only once, and use letters as a means of communication. H. G. Wells also has a role here to play in assisting with the letter writing, thus linking this section with the previous. Wells becomes “the Hero”, i.e. the primary character, in the final section where he is visited, or has communication with, someone from the future. It is through the communication and the visitations that he faces a decision which ultimately decides the fate or future of time travel. This is inherently a tricky section to write, given that for the most part there is no actual time travel! In order to avoid spoilers I’ll refer only to the last section of the novel where time travel is more fully realised. The method of time travel operates through a genetic ability which gets refined through time. Initially time travel occurs involuntarily, though later, as the gene is refined and the ‘user’ becomes more adept at using this skill, time travel is more controlled. These characteristics reminded me of the (non time travel) movie Jumper and Audrey Niffenegger’s time travel novel The Time Traveller’s Wife. There are lots of time loops, and paradoxes are avoided with parallel universes. In fact, the idea of parallel universes is central to the time travel element in The Map of Time. It is consistent, well thought out and well presented in the in the novel, but personally speaking I find parallel universes an easy escape from time travel paradoxes. And it certainly brought about a very disappointing end to the novel where it served as a mechanism to bring about a happy ending. Or did it? A lot of the novel isn’t really connected with time travel, but at the same time there is frequent use of vocabulary related to time and time travel, and insights given into the author’s thoughts on the subject. At times it’s like your Grampa reading you a bed time story; friendly and warm, descriptive with a personal insight to an interpretation of events, and a little bit more of a hint that the writer is an all-knowing omnipresent character. In this way, the author becomes almost a character within the novel he is writing! The average motion through the plot of the novel is linearly forwards, but there are plenty of digressions which seem at first to take a tangent but actually gently circle back to the main story line. Sometimes these read a little discontinuously (especially between each of the 3 sections of the book) but overall it’s fluent, and probably best described as ‘flowery’! In keeping with the flowery style of writing and story lines, the main character changes quite frequently. I can see that for some readers this might be cause for irritation, but I think it worked well as the characters who, like the tangential sub plots, had a tendency to come back. The common thread through all of this is H. G. Wells whose role varies from stage extra to key character. I would argue then that H. G. Wells is the central character, in that he is present to some degree in all of the main story lines. Indeed, he is also present in the sequel (The Map of the Sky) which refers to his book The War of the Worlds. Sadly I was hugely disappointed by the ending which read largely as an introduction to the next book (The Map of the Sky). As far as I can tell from the reviews, the sequel seems to follow pretty much the same pattern as The Map of Time – using H. G. Wells’ War of the Worlds as a base in place of The Time Machine. The Palma’s self publicising aside, things ended happily ever after thanks to a parallel universe, about which I have already hinted of my frustration! The elephant in the room of course is H.G. Wells’ The Time Machine, but that’s the whole premise of the book. Not quite fan fiction, not quite poetic licence and not an out and out fabrication of historical events, but a very clever clever an original idea! The Map of Time by Felix J. Palma is a beautiful time travel novel with very little time travel! That said, there are plenty of methods of time travel presented, although disappointingly (from the time travel perspective) use parallel universes to explain away paradoxes. In essence this is a romance novel, but there’s enough science fiction in there to make The Map of Time into something much more special! I’m giving this 4/5 stars…which isn’t bad for a time travel novel with actually not that much time travel! The Map of Time is available from Amazon.co.uk and Amazon.com . Enjoy! Most reviews of Time and Again by Jack Finney are glowing. About Time, a collection of short time travel stories by the same author is a fantastic piece of work. And miscellaneous short time travel stories by Finney in other compendiums are also excellent. I had high hopes when I ordered my copy of Time and Again. Simon Morley (or “Si” as he’s referred to) is an artist who is selected to take part in a government experiment with time travel. He goes back in time to New York in 1882 and is instructed to observe, and on later trips, to interact with characters who he finds there. His motivation is to watch an envelope being posted. The envelope contains a letter with a cryptic message, and the story line loosely revolves around the sequence of events leading up to, and immediately after the event described therein. At one point in the novel Si is able to wrap his arms around another character and take her on his travel in time too. The method of her solitary return to her own time is not revealed, though by the time that this point in the novel is reached the time travel method doesn’t see to be of much significance. There doesn’t seem to be ‘fine control’ in the sense of a specific moment in time for arrival. Again, this doesn’t really seem to be an important point within the context of the novel. Under his self hypnosis, Si is aware of his journey into the past, and is able to return to the present at will. Upon return he relays a stream of general information to the experiment leaders. The idea is that if there is an inconsistency between his version of facts and the version that the non time travellers know, then this signifies a different – i.e. altered – history. In one case, another time traveller recalls a character who now no longer exists in the present. This indicates the importance of historical events and their impact on the future. That said, a nice idea is presented where time flows as a turbulent river. In a similar way that small disturbances in a large river peter out into nothing, small events in the past won’t affect the future. In effect, nature snaps back to its normal position. This is diametrically opposed to the idea of the butterfly effect where small events in a chaotic system (such as the flap of a butterfly’s wings in the atmosphere) can cause large events (such as a hurricane). The case of the now-non-existent-character is therefore in disagreement to this premise, as is the paradox presented at the end of the novel…maybe…the question is left open. Like many time travel stories and novels, Time and Again is written in the first person. A writing style adopted often as a nod to H. G. Wells and The Time Machine, as nearly as often not adding much to the novel, the first person style in this case does give depth. This is because the novel is written as a journal, coming complete with pictures which are presented as sketches and photos that the main character has sketched or taken. To the Finney’s credit, this substantiates the incredible amount of research that has gone into reproducing New York in that era, though almost to his own admission in an afterword this became quite overdone. I never fully realised what the story line in this novel was. Si latched onto a character in 1882 new York, Julia, and this is probably the strongest case of a plot, turning a description of a historical New York into a disjointed and uneventful time travel romance. But Si’s affair with Julia seems to be pointless – I didn’t find Julia a particularly deep character, and the fact that Si becomes attracted to her to the point of ditching his current girlfriend I think shows his own shallow and superficial nature. On reflection, I must have missed something because such a person wouldn’t have been selected to take part in this government experiment in the first place. Having finally got to the end of the book I realised the thinking behind Time and Again – it’s a story woven around a number of known (researched) descriptions and events. Very clever. I loved the idea of the enormous river of time smoothing out earlier changes and I’m sure that this also has a founding somewhere, just as the detailed descriptions of places and signs and billboards in other parts of the novel. That said, I found Time and Again to be a novel with a drawn out beginning, no middle and an end where things begin to happen. The beginning is where ideas behind time travel are presented. But it takes a lot of dreary reading and it really is spoon fed to the reader. It’s like pushing jelly through a keyhole. Nothing much actually happens in the central part of the novel. Just pages and pages of description of a 1882 New York. Events are non eventful and descriptions of the area are overtly lengthy with no real significance. Very little actually happens. Page after page. Time and again. For those living in New York or those who have a good knowledge of it, I think this might be a fascinating read. For myself, I found it tedious. I was waiting for the story to start, but the end came before I knew it, and by then, it was only just beginning. I’m not sure that there was a definite ‘end’! The beginning of the novel starts near the end. By “beginning” I mean actions of note. These actions were full of suspense, though by now the dry style of writing had somewhat numbed the brain. A key point is that things tend to be a little coarser in the past than in modern life (for example, less civil liberties and rights) and there’s a certain amount of sympathy for Si. But his hindsight of events never comes into play. This is faithful to the role of observer-only, but I think it would have made for some interesting angles. There is very little to tell the (late and non exciting) action sequence in this book apart from an action sequence in a non time travel novel…except for Si’s disappointingly weak escape by travelling out of the time period. To its credit there are two highlights to the final section of Time and Again. The first is not just seeing a modern day New York through the eyes of a 1882 citizen, but how a modern day person would explain those things to a character from 1882. For example, how is it best to explain the world wars, or aeroplane contrails seen for the first time, etc.. It was during these scenes that I started to a deeper side to Si’s character. The second point of interest is the final conclusion. The premise of the time travel element seems to be that events in history don’t effect the outcome in the future to a great degree, and yet…this is turned on it’s head. In order to avoid a spoiler I won’t divulge in this further. But it takes place only in the last 2 pages of the novel. I was expecting a lot from Time and Again but was bitterly disappointed. I’ve seen reviews on Amazon which indicate that the sequel isn’t up to much and doesn’t measure against Time and Again. I don’t think I’ll be giving any time to that novel. Now that we’re in summer time I departed for work on a train which left – relatively speaking (and even though it turned up late) – an hour earlier than the same time last week. I found myself sitting on a journey which previously, morning by morning, had got steadily brighter. Now, like a temporally backward hiatus, I was thrust back into darkness, at least for the first leg. It’s fairly dark in the mornings at 7 am (summer time) at this time of the year in Holland, but as the vagaries of light reflecting upon the outside world and hitting my dreary retinas became clearer, I was shocked to see the ground covered in a frost of icy but magical fairy tales, and trees draped in ice like spectres of the night. What had happened to the daffodils and tulips and other spring-ey kind of things I had glimpsed only days before? Had I finally traversed through time on a train, upon which I have had seemingly endless musings about time travel? It wasn’t too long of a wait until I realised what I was looking at: white blossom and the usual dreary white concreted grounds of Holland. So no time travel (which regrettably in this world of predictability, comes as no surprise). A couple of stations further on a gentleman seated himself opposite me with the assistance of a white cane. His gaze was distant, though I’m sure that his sight was indeed incredibly – if not infinitely – short-sighted. Most other passengers (and despite my third person observation of them I include myself here as one of them) were using vision to gauge our traversal across space all the while passing the time. Our visually impaired travelling companion was not optically equipped to keep himself so-occupied in this way. What was going through his mind I had no clue, but surely his mind was not as cloudy as his vision; he had navigated the platform, the train doors and the passage way to find his seat by the glass door separating the populated carriage with the entrance hall of the train all without the assistance of onlookers and those with whom he was embarking the carriage. How does a blind man see the world in his imagination? Against what observation or perception does he measure his journey, be it the distance towards his destination, or marking the passage of time, the punctuation of which is so necessary to alleviate the boredom of doing nothing? A piercing whistle dragged me from my thoughts and from those of the blind man back to the train which lurched suddenly to a stop. Shortly a lady sporting too much make-up and armed with five small paper bags hooped in the crook of her inner elbow burst through the door. She was evidently relieved to not have missed the train which, even as she was bustling down the aisle, was accelerating away from the station at a pace to make up for lost time. The glass door flung to behind her, beginning to trace the path along its predestined and extravagant pendulumous swing, seeking its final resting point of closed equilibrium at the end of its trajectory. Without turning his head, the blind man reached out his arm and let the door fall back on his hand, fingers slightly splayed. As he allowed the beveled edge of the door to gently caress his hand and come to a silent rest, I came to realise that perhaps this soul whose perception of the world was won through audio means, and maybe an as yet unknown further sense, was more aware of space and time than the rest of us are. I continued reading my book, The Time Machine. It was a reread, and though the words on the pages were invariably the same as the first time I had read it, they had struck my consciousness and I found that they spoke to me now with a deeper clarity than before. I put my book away as the train neared my station. I glanced out of the window and caught sight of the rising sun which was still low, a perfect disk of orange through the mist. Unlike the large dull red future sun of Wells’ Time Machine, my sun would live to see – or indeed create – another day. I rose from my seat, though not as majestically as either the sun of the future of the present. I followed my doppleganger and stepped off the train, ready to embrace what that day had in store for me. So tonight’s the night. (Or is it tomorrow morning’s the morning). At 2 am we put our clocks forward to 3 am, and await the semi annual discussion of whether it’s a good idea or not, and whether we should just keep summer time in place in winter, and in summer put the clock forward an additional hour. Actually there are two things to spot…firstly that it would be summer time in winter, and secondly, we “spring forward” an hour in spring…and call it “summer time”. Ah well. Us humans can be a little bit crazy like that, but I suppose we have to live with it. So I started downstairs at 18:50, and moved the clocks to 19:50. At 19:00 (i.e. 20:00 according to the downstairs clocks) it’s time for my girls to hit the sack. Cue the tooth brushing, bed time stories etc. and 45 minute later they’re both down. But before I head back downstairs, it’s time to set the upstairs clocks. Now I know it’s an hour since I was downstairs doing the same thing, but there’s a certain part of me which thinks I’ve just put the clocks forward 2 hours. Yeah, I know. That would be crazy! Two things happened when I started reading Loveless and Godstone Regret. The first is that it made me put down another book I’d already started reading. The second is that I got the absolute heebie jeebies! Twice actually. I started reading it on the train to work, and there in the opening pages was a description of commuters at a train station shortly before – and during – the end of the world. And if that didn’t give me the crappers, what really did was when I read about a moment when everyone’s mobile phone rang at the same time on that train. Why? Because for reasons unknown to mortal man, when my own phone has a low battery, it vibrates. Presumably it does this to drain the little remaining juice the battery may hold and force me into recharging it quicker. And of course, it did this to me at precisely the same moment that I read about all the phones going off simultaneously. When Jack Loveless becomes an unwilling pawn in a bank robbery he unknowingly discovers a key for a time machine held in one of the vaults. He gets caught in a seemingly unavoidable series of events when he’s rescued from an arrest for the robbery, and before long he uncovers a plot to destroy the world. Trying to understand exactly what is happening, by who, and why (and how to control the time machine!) Jack and his arresting officer (Harry Godstone) stumble from one moment in history to another only making things increasingly worse for themselves. The time travel element is introduced very early on with an original idea that by including people in the past as members of the total population then the chances of DNA matches in otherwise statistically high and impossible odds are possible. So as H. G. Wells famously quoted in his “The Time Machine”, time is treated as another dimension and divisions between people, be they geographical or temporal, can be removed. Nice! The two main characters, and later their companions, move through time with a time machine. An interesting angle is that the machine is called with a portable key which also serves as the controlling device in terms of temporal destination. The physics behind the operation of the machine – launching into a slingshot around the moon and landing back on the Earth at a different moment in time – is of course unrealistic, but perfectly fitting with the slapstick comedic style of the novel. For the most part, characters are literally dropped into different eras and before they know it, lifted up and re-dropped somewhen else. In this respect I was reminded of The Time Machine where Wells’ time machine was only an object to change the setting of the novel for the characters. Unlike Wells’ novel, and more like Time’s Eye (Arthur C. Clarke and Stephen Baxter), tramping about time did allow for an interesting play between historical figures of different times, brought together. For me, the real juice of time travel comes towards the end of the novel. Unfortunately it reads a little as though it’s an explanation of what has happened earlier – which of course it is – but I think it could have flowed a little more naturally. So what makes the final section juicy? In the entirety of the book there are lots of things happening and lots of things going on. At the time of reading not much attention is paid to a man on the roof, or a tattoo on a finger and so forth – but at the end of the novel many of these things are shown to have significance, and for me this makes Loveless and Godstone Regret a well thought out and delivered novel. This is primarily a comedy novel, and the humour is an exotic concoction of Terry Pratchett (of Discworld fame) Douglas Adams (of galactic fame) and a hint of Red Dwarf (of extra-galactic fame). However you define it, it’s relentlessly funny on every page! Humour is a tricky thing to nail, but Mark Williams has really hit it on the head! The characters – what’s in a name? Jack Loveless: the main character; basically a good guy to whom bad things happen. Harry Godstone: Jack’s sidekick – a suicidally depressed and violent copper, bent on nicking Jack Loveless. It is perhaps a small point, but I thought that violence would be expected from a man named “Loveless”, and “Godstone” is mildly suggestive of a moral compass, more ‘suitable’ for an unwitting hero like Jack. I was also surprised that Jack was usually referred to by his surname (again, more fitting to someone in the police force) whereas the police officer was referred to on a first name basis. Still…I was too busy laughing at the comedy and being interested in the time travel aspect to pay much attention to the possible misnomer. I have only one negative observation with Loveless and Godstone Regret, and I admit this is subjective; there is a lot of violence. It’s not bloody or gory, but there are lots of people dying and being killed and it seems out of place in a comedy and a lazy way to get rid of awkward or difficult secondary characters. I should also say that I was surprised to read a scene with a horse which I found to be a little offensive. Admittedly, I am a sensitive chap (perhaps too much so) but I think the nature of the scene didn’t add anything to either the comedy or the plot, and like the violence, would tend to make this novel unsuitable for sensitive and young readers. That said, it is only one paragraph, so perhaps not too much attention should be paid to this bit! Loveless and Godstone Regret is a brilliantly funny novel with time travel thrown in for good measure. It’s well thought out with many clever applications and twists associated with romping through time. Violent at times, but hilarious all the way through! Loveless and Godstone Regret by Mark Williams is available in print (through Amazon) and as an ebook (through ibooks) at www.markwilliamsnovels.com. Disclaimer: A copy of Loveless and Godstone Regret was given to me free of charge for the purpose of providing this unbiased review. This review reflects my true and honest opinion of the novel. When do you feel happier – 3 pm on a Friday, or 9 pm on a Sunday? Many would say the former, as the weekend is approaching when we’re not shackled up with employment. The irony is that at 3 pm on a Friday afternoon we’re still at work when we’d rather be at home…like at 9 pm on a Sunday evening. Maybe our minds live further along the time axis than the rest of us! Some time ago I wrote about an infinitesimally small moment in time by using a thought experiment involving a fly and a train. We know from harsh experience that trains don’t run on time. Like mine this morning, which was cancelled. Or perhaps occupying an infinitesimally small spaces. Whilst watching the wheels on the…train (on the opposite platform) go round and round, I got round to thinking about the point of contact between the wheel and the rail. Let’s assume that the train wheel is perfectly circular and incompressible, and that the train line is perfectly straight and also incompressible. How much of the wheel touches the train line? OK, I’m no graphic designer, but I’m trying to show that no matter how much you zoom in, the point of contact between a circle and a straight line remains just that – a point. Friends at the goodreads.com time travel group directed me towards this strip from SMBC comics. Despite the humour, who’d have thought that event the thought of time travel could give you an aneurysm! My previous job was a bore. I’d sit in the office staring at my watch just waiting for the tedious hours to pass. Waiting to spend my time in the way I want it, where I wanted it. Was spending 8 hours a day like this worth the money? At the time I thought it was, but from my new present position I must say that I have really learnt that time spent wisely is worth so much more then money. Money can be hard to come by, but it’s even harder (for now) to get more time. For now, I love what I do…but I still wish someone would hurry up and invent that time machine! Author Paul WandasonPosted on February 17, 2014 March 14, 2016 Categories ThoughtsTags money, time, time machineLeave a comment on Time is money? No…it's greater! When I picked up my daughter from school today, she was proudly carrying a ring binder full of drawings and things she’d done over the past week or so. She was very happy until we got home and started showing them off to me, and found that one sheet had not been hole punched. I’d like to think that I’m doing a good job in raising my daughter to think outside the temporal box! Author Paul WandasonPosted on January 5, 2014 March 14, 2016 Categories ThoughtsTags instant, thought experiment, time machine, watch, zeroLeave a comment on Watch the time machine! Consider the chart below. The curves are two simple sinusoids, and represent, say, the variance of the height of two swings above the ground as they swing in a simple harmonic motion. Which of the swings, blue or red, would you say is in the lead? Which sine curve is in the lead? For most, the instinct is to believe that the blue swing is in front. But this would be wrong! The blue swing in fact lagging behind the red swing! Even with the x axis labelled as “Time”, we are predisposed to visualise the sine curves in space and not in time. When we read off the sine wave maxima on the x-axis we can see that the blue swing reaches it’s maximum height at t = 1.5 seconds, whereas the red swing already reached it’s maximum height half a second earlier at t = 1 second. So the red swing is in the lead. Somehow it seems counter intuitive, that the red swing got there first. It made its history first. It’s sitting there in the past, yet it’s in the lead. I suppose it depends on how you look at it. Maybe it’s just swings and roundabouts! Yesterday (or was it last week? 😉 ) I posted a timely thought which explained why history is important. I used an example of flipping an unbiased coin which repeatedly turned up tails, and stated that even though historical performance would suggest another tails on the next flip, the chances of heads showing on the next flip was still 50%. I think a 50% chance of a heads showing is incorrect. It should be higher! This is because that there are 2 possible outcomes of a flipped coin, so 50% chance of getting either one of them. The implication then is that with 2 coin flips, we’d expect 1 head and 1 tail. With 4 flips we’d expect 2 heads and 2 tails. With 100 flips, we’d expect 50 heads and 50 tails. But who’s to decide the order in which those heads and tails come? Alternate? Or all one and then the other? So take the example in my original post where 50 flips had given tails. I’d stated a 50% probability of the next flip being heads. But if the probability is 50% for 100 flips, then the probability of the 51st flip being heads is now…100% !!! So it seems that history is even more important than I had previously thought…although I wonder whether this is because we know something about the future i.e. there will be 100 coin flips and then no more. But let’s add in a parallel consideration…we’ve considered this particular coin, but shouldn’t we be taking in all coins, and all of their flips, ad infinitum? That would mean we’re back at a 50% chance of a head. So boundary limits impact the probability; events at all places at all times impact the importance of history and what that history means for the future. Interesting that although I’m now a little wiser in the future…a little hindsight about foresight would have helped when I first wrote! Author Paul WandasonPosted on November 12, 2013 March 14, 2016 Categories ThoughtsTags coin, future, history, outcome, past, probability, thought experimentLeave a comment on The Importance of History: An Unexpected Part 2! I’m not one for history. It relates to things in the past. Not necessarily forgotten about, but it’s been, it’s gone, and it’s over. Done and dusted. But however dusty those history books might be, I do concede that history is important. I hold no sympathy for the “You don’t know where you’re going if you don’t know where you’ve been” line, but history can effect the present and the future. An unbiased coin is flipped, and tails comes up. It’s flipped again, and again it’s tails. And it’s tails again and again and again, and so on…at 50 flips the coin is still coming up tails. The probability of heads coming up for the 51st flip, mathematically speaking, is still 50% i.e. there is an equal chance of getting either heads or getting tails. But given the history, what would you bet on…heads or tails? Author Paul WandasonPosted on November 11, 2013 March 14, 2016 Categories ThoughtsTags coin, future, history, outcome, past, probability, thought experimentLeave a comment on Is History Important? I won a PDF copy of The Photo Traveler from Arthur J. Gonzalo as part of a Goodreads.com giveaway. This review, as with all my others (past and those to come) is my honest opinion. Gavin is a 17 year old boy who seems to have had more than his fair share of suffering in his early life. He leaves his abusive adoptive parents and finds his grandparents who tell him that he can travel back in time by reciting a chant when looking at a photo. Gavin learns that whilst this hereditary ability can be fun, there are rules which must be followed. He’s also warned of a danger in the form of other families who wish to harm him. Gavin is able to travel back in time by vocalising a chant when looking at a photo. As a photo traveler he is taken back to the moment in time when the photo was taken. He returns to the present when he recites another chant. This method of time travel is beautifully illustrated when Gavin meets his parents ‘in’ a photo. When he asks how long they’d been there, they reply (along the lines of) “Same as you – we can’t have arrived before the moment that the photo was taken.” It is a simple restatement of the method of time travel, but I thought it was elegantly expressed in application. Time experienced in the past occurs in real time – if one hour is experienced in the past, then the photo traveler will have been missed in the present for one hour. Gavin nearly always returned back to the present because he considered he’d be missed. A single photo can be used more than once, though this never occurred in the novel. It seemed to be a strange oversight, especially given that Gavin had specifically asked the question of whether it was possible to his grandparents. That said, there was a nice touch was where Gavin and Yogi agreed to meet each other at a location in a photo each of then had access to over the internet. The Photo Traveler is written in the first person from Gavin’s viewpoint. This makes the novel easy to read and quickly engages the reader with Gavin. Unfortunately, I found that this style of writing became inherently irritating in that it reads as account by a teenager who’s out to impress his mates with a story – a lot of telling not showing, superlatives and over dramatisation. Even the dialogue from his grand parents was very childish, but I’d like to think that this was Gavin’s ‘translation’ of what they really said into his own vernacular in the narrative. Gavin’s character is key to the novel, given that it is through his eyes and interpretation of events that The Photo Traveler is written. The references to Gavin’s troubled early years reminded me a little of the Butterfly Effect movie where similarly, the main character had a dark childhood. The events subsequently became hook points in the movie (and indeed, the sequel to the first movie used pictures and not text to time travel), so I was wondering whether there was a purpose to Gavin’s difficult childhood. Gavin’s history, I think, provided a little bit of depth to his character. I started out liking Gavin who generally sees things in a positive light and tends to put other people first. Or so our melodramatic teenager would have you think of him. It becomes clear later that Gavin’s actions are in juxta-position to his self inflating words and thoughts. For example, he finds the love of his life in Allana, the sister of one of his college mates. The complication is that Allana was killed in a car crash several years ago, and the only way they can meet is by Gavin’s photo traveling. Gavin has only 3 photos of Allana and therefore feels restricted in that he can only see her during those 3 moments when the photos were taken. He takes no effort to get more photos of her, or indeed, to revisit her by ‘reusing’ any of his 3 photos. No, he wallows in his own self pity and goes on to have tantrums and fights. My enthusiasm and empathy for him as a young adult fighting to overcome his history evaporated. His interactions with other characters at times seemed a little overdone. Whereas in a movie these encounters, be they conversations or fights, might last a few seconds, I felt that reading through a couple of pages didn’t add anything to the plot. Then again, this again might have been Gavin’s exaggerated interpretation of events given in hindsight. At first I thought it may be Gavin’s quest to find his parents, but he finds them very quickly. Then there was a lot of harping on about vials and being in danger. But there was no real evidence of a continued threat to Gavin. Indeed, I found the whole vial thing and fluid from a purple underground river a little contrived and underdeveloped. Maybe this will turn into something more substantial in subsequent books. And there was Gavin’s love interest with Allana – his ‘dead’ ‘older’ girlfriend who was living in the past but dead in the present. I found this the most interesting aspect of the Photo Traveler. Gavin had found lots of photos of Allana but had taken only 3. They had a baby. They shared a link through her brother and his mate. This was bursting with time travel opportunities, paradoxes and conundrums, but sadly nothing much seemed to come of that. Lacking a clear plot, I found myself reading on a chapter by chapter basis, rather than as an entire novel with a clear theme running through those chapters. A nice touch in the novel was that photo travelers are drawn to photography. Perhaps this would make sense, or be expected, but I thought that this added some depth to an entanglement of hereditary nature and personal interests. Sadly, aspects of some events within the novel came a little too easily. For example Gavin was able to find his parents within just a couple of days where his grandparents had been unsuccessful; I questioned Gavin’s grandparents’ motivation for not engaging in time travel which came across as a weak get out clause for sitting back and doing nothing. Gavin’s own motivations and thoughts at times were quite fluffy and lacked solidity. Again, perhaps this age related, but it made things unrealistically too easy. He just knows this is the right photo, and he just feels this connection with this character, and so forth. Typical mysterious lexicon from a teenager? I can’t remember(!) but a little more substance would have firmed it up nicely. The end of the novel came so abruptly that I re-downloaded my PDF file to ensure that it wasn’t corrupted. It wasn’t. The novel ends in much the same way as most of the chapters – with a melodramatically played out cliff-hanger. Cliff hanger? More like a gentle grassy slope. By the end of the novel I really couldn’t care less for Gavin, his friends, or family or whatever, so cliff-hangers tended to play very little significance. I was hoping for a conclusion to something or other (to whatever the story line was about…) but there was nothing save for a suggestion to keep my eye out for Part II, the Peace Hunter. The Photo Traveler is an easy to read novel aimed towards young adults. It has a very interesting method of time travel, and one which has the possibility to open many avenues for time loops and rewritten histories. Like H. G. Wells’ The Time Machine, this novel is written in the first person. It describes events as seen through Gavin’s eyes, a troubled 17 year old who’s had a tough childhood. Unfortunately he’s a bit of a pleb and empathy with him soon deteriorates – his melodramatic self serving viewpoint spoils the novel as the first person style of writing becomes inherently irritating. Whilst I found the main story line unclear there are several small scale incidents which make the Photo Traveler an easy page turner and a good book to take on a holiday. There are some very nice applications and expressions of the method of time travel in the Photo Traveler and I’d recommend this novel to any young adult looking for an introduction to the time travel genre. I recently bought myself a new wall clock. It was an impulse purchase, but at only 2 Euros I couldn’t go wrong. Or so I thought until I had a closer look. Can you spot it? A wall clock with a manufacturing printing error sold off for only 2 Euros? Or a cunning representation that both space and time can be intricately linked…as well as warped? Author Paul WandasonPosted on October 31, 2013 March 14, 2016 Categories ThoughtsTags clock, warpLeave a comment on Warped space time? The clocks go back an hour tonight. The addition or subtraction of an hour twice a year in an effort to optimise daylight hours has been going on for years, and yet still causes countless people to get confused, turning up too late or too early to various appointments. It might seem like some sort of pseudo time travel when people turn up at different places at times they thought were different, but it’s just time (or it’s representation) moving onwards (or backwards as is the case now) and not taking us along with it on it’s hourly journey. Now it’s Autumn. We ‘gain’ an hour, but lose the sunlight. I for one am happy as I can stay in bed longer tomorrow morning. In theory anyway – I have two young children that haven’t mastered the concept and will still wake 3 hours before I’m ready to get up. 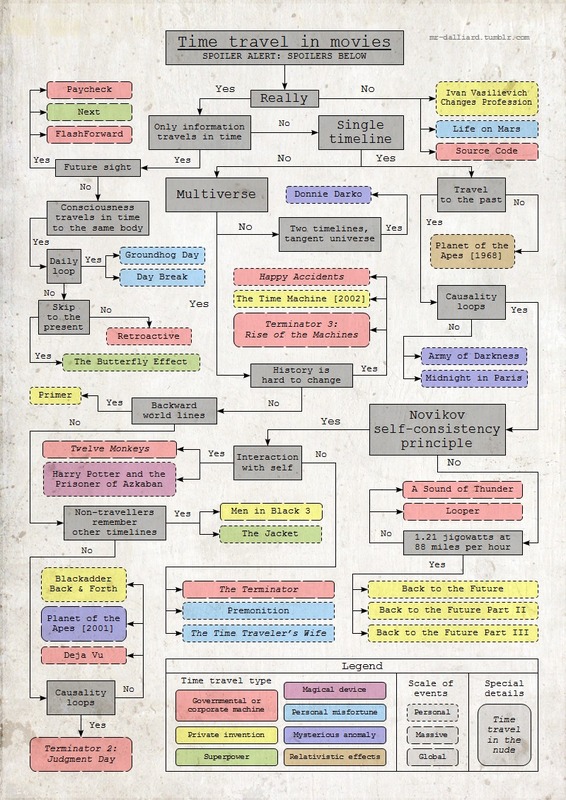 Movies containing elements of time travel are depicted in this flow chart created by mr-dalliard. Be warned that although the chart is informative it contains spoilers! Click to enlarge, and enjoy!